This Thanksgiving, maybe you'd enjoy getting outside a bit. Want to go on a walk in the woods with us? This walk is both real - via video, anyway, - and a metaphor for spiritual journey. You might be surprised by invitations to reflective "pause points" in this 5 minute video, and you're joined by some companions on the way! What are your spiritual practices this fall? Here's a 1 minute, 10 second invitation to pause and reflect. These moments are so necessary for living a call-based life! Fall is in full swing, for sure - but if you want a break with delightful themes, try UP: “A man of many companions may come to ruin, but there is a friend who sticks closer than a brother.” (Proverbs 18:24). Out on DVD Nov 10th. Pixar’s tenth movie, Up, co-directed by Pete Docter (Monsters, Inc., Toy Story, WALL-E) and Bob Peterson (Ratatouille, Finding Nemo) continues this studio’s string of unlikely heroes. This time, a grumpy 78 year old balloon salesman, Carl Fredricksen (Ed Asner) who is filled with grief over the death of his soul mate and wife Ellie, is cast in the role. Certainly a strange lead character for a “children’s” movie – but then, Pixar’s animated movies have always been for the whole family. Here is an intergenerational film that can provoke great discussion. 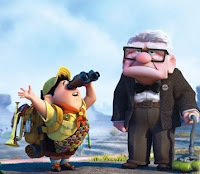 On the surface, the movie is an adventure story depicting the adventures of Mr. Fredricksen and Russell, a chubby, eight year old, junior wilderness explorer who badgers the cranky senior citizen to help him get his final badge (for “assisting the elderly”). In grand Pixar style, one filled with simple, yet glorious visuals, the two take a road trip like few others. They soar to Paradise Falls, South America in Mr. Fredricksen’s memory-filled house, carried aloft by thousands of colorful, helium-filled balloons. But like all road movies, Up is more about the relationship than the adventures on the road. The two lead characters meet up with packs of dogs, dangerous cliffs and frightening weather, not to mention an embittered explorer, Charles Muntz, who chases after them. But adrenalin is not the heart of the movie. Rather, Up is about love and friendship. The set-up, or prologue, to the road trip takes twelve minutes – twelve of the finest minutes of animation ever filmed. We see Carl and Ellie meet, two misfit kids who perfectly match. Their romance and subsequent seventy years together are as tender and sweet as anything you can imagine. In a four minute wordless montage of photos, interpreted only by Michael Giacchino’s evocative music, we experience their dance of life. Carl and Ellie’s hopes and dreams become ours, together with their all too real disappointments. In particular we see how their dream of a trip to the legendary Paradise Falls must be repeatedly postponed given flat tires, home repairs and health bills that must be paid. So when Ellie dies, Carl is left a broken man, alone in a house full of memories and a dream still unfulfilled. Into this situation steps the roly-poly Russell (Jordan Nagai). He knocks on Mr. Fredricksen’s door, hoping somehow to help him and thus earn his merit badge. Though there is seventy years difference in age, they have more in common than one might think, sharing both loneliness and unfulfilled dreams. Though it takes most of the movie and countless adventures for them to discover what we as viewers sense early on, their friendship does blossom. As the movie ends, the two are sitting on the curb in front of Fenton’s Ice Cream (an homage to a real life creamery near Pixar headquarters which we’ve enjoyed personally), counting red and blue cars like Russell said he did with his dad. “It might sound boring,” Russell opines, “but I kinda think it’s the boring stuff I remember the most.” Love and friendship are adventure enough, something Carl has also discovered in the pages of Ellie’s scrapbook, “My Big Adventure”. It portrays in wondrous ways a simple spirituality of everyday life, one that proves more breathtaking than even soaring balloons. The central metaphor of this movie is the house Carl lives in. In the beginning it symbolizes his shared life with Ellie. It is more than a house; it is their home. Thus, when Ellie dies, Carl holds on tenaciously to it, not letting the house be bulldozed to make room for new buildings. Failing, however, in his attempt to save their home, he chooses to put the house afloat with his helium-filled balloons. If Ellie died before they could go to Paradise Falls together, he will take their house filled with her memories to the Falls! But ultimately, when Russell needs him to, Mr. Fredricksen is willing to leave the house behind, despite its priceless memories. He cuts it loose in order to be true to his new friend. As one film reviewer perceptively observes, the house is an astounding metaphor for Carl’s journey through love, grief, loyalty, and malaise, to a final acceptance and a hard-won peace. Guest bloggers: Rob Johnston and Cathy Barsotti are long time friends of Lumunos who wrote the movie review for the Faith at Work/Lumunos magazine for several years. Cathy Barsotti is an instructor for Centro Hispano de Estudios Teologicos - a Latino Ministry training center in southeast Los Angeles. Rob Johnston is Professor of Theology and Culture at Fuller Theological Seminary. His books include Useless Beauty (Baker, 2005), Finding God in the Movies (Baker, 2004, co-written with Cathy), Reel Spirituality (Baker, 2000) and Life Is Not Work/Work Is Not Life; Simple Reminders for Finding Balance in a 24/7 World (Wildcat Canyon, 2001). Their reviews can also be seen in The Covenant Companion.